Christian Siriano was the youngest winner of the American design competition show Project Runway. He launched his namesake "Christian Siriano" collection in 2008 which made him a millionaire by the age of 24. At the end of the event Victoria Beckham said that she would love to wear any piece from his collection. With the money that he won from the contest Christian put out his first line in 2008. 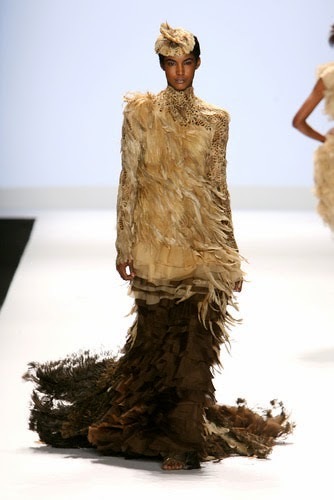 Here is a picture of the two toned feather dress that was at the end of his winning runway show at the Project Runway contest.